With the Senate Health, Education, Labor and Pensions committee hearings, aimed at stabilizing the Obamacare marketplace, unfolding in the early weeks of September, two deadlines loom. September 27 is the deadline for insurers’ final decisions on whether to offer plans in 2018. The most important element remains the availability of low income premium subsidies that the Trump Administration has thus far approved on a tenuous month-to-month basis while threatening to stop them altogether. The Administration also signaled its continued opposition to Obamacare implementation by announcing a major cut in funding for advertising and promotion for ACA enrollment. The move was met by strong criticism in a letter from ranking Democratic members of the five House and Senate committees with health care reform jurisdiction. Meanwhile a deadline of a different sort has been set by the Senate parliamentarian who has now ruled that Congressional use of the reconciliation process to pass a repeal bill with just 51 votes will expire September 30, thereby significantly reducing the opportunity for Republicans alone to enact renewed ACA repeal legislation. A long-running struggle by long-term term care advocates has finally culminated in a CMS announcement of a new web page implementing a court decision (Jimmo v. Sebelius) that requires recognition of a “maintenance” standard for determining Medicare skilled level coverage. As described in a press release from the Center for Medicare Advocacy, the web page makes clear to patients, families, and providers that “Medicare does cover skilled nursing and skill therapy services needed to maintain a patient’s function or to prevent or slow decline. Improvement or progress is not necessary as long as skilled care is required. The Jimmo standards apply to home health care, nursing home care, outpatient therapies, and, to a certain extent, for care in Inpatient Rehabilitation Facilities/Hospitals. Mandatory bundled payments for joint replacements and cardiac treatments, heralded by President Obama’s CMS officials as a Medicare cost saving measure, will be substantially curtailed by the Trump Administration according to an August proposed regulation. The complex proposal invites comments through October 17. One family’s very distressing experience with a partial hip replacement bundled payment episode is narrated in a blog post referenced in the Media Watch section (last entry). The substantial cost burden of dementia compared to the cost of caring for someone without dementia is examined in a study that evaluates the effect of reducing functional decline on behavioral and psychological symptoms by 10% for 12 months. “From time of diagnosis,” the authors report, “costs for a person with dementia over a lifetime were $184,500 greater than for someone without dementia. In early August the National Institute of Nursing Research convened a national conference, The Science of Caregiving: Bringing Voices Together Summit. The event gathered scientists, caregivers, providers,and healthcare professionals to learn about the issues and challenges facing caregivers and related science. Keynoting the “Summit” was PBS NewsHour’s Anchor and Managing Editor Judy Woodruff, who delivered a moving, personal account of her family’s difficult experiences caring for a disabled, albeit thriving, son. FCA Executive Director Kathleen Kelly moderated Plenary Session 2, Creating Change in Caregiving: Research to Policy. 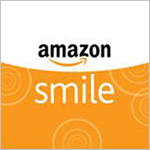 The entire program is available for viewing online . The National Center on Law and Elder Rights is a newly established Internet resource providing free case consultation assistance for attorneys and other professionals seeking more information to help older adults. The Center also offers a national web-based legal training curriculum on topics ranging from health and long term services to advance planning, elder abuse, and consumer protection, with relevant materials available for download. Eduardo Porter, also taking to the pages of the New York Times, makes a strong plea for improving the working conditions of the thousands of home health aides, personal care attendants and certified nursing assistants who provide long-term care for a fast aging population. “Home care is absolutely the bottom rung of the ladder, but home care workers are the people that spend the most time with the client,” according to Adria Powell, who runs Cooperative Home Care Associates in New York. Porter points to a new book by MIT professor Paul Osterman—Who Will Care For Us—that argues that despite a number of deep-rooted obstacles, shortchanging long-term care is shortsighted. Home health aides trained to do more—to spot patients’ health problems, to keep track of the pills and doctors’ appointments, and to offer advice on healthy living—could wring billions of dollars in savings from the healthcare system. 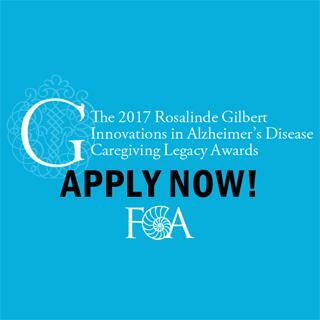 Family Caregiver Alliance is seeking innovative Alzheimer’s/dementia programs that support caregiving for awards of $20,000 each. The Caregiving Legacy Awards are possible thanks to the generous and continuing support of The Rosalinde and Arthur Gilbert Foundation. The Caregiving Legacy Award categories include: Creative Expression, Diverse/Multicultural Communities, and Policy and Advocacy. This is an award (not a grant) for existing programs. * Yes, there will be a deadline extension announced early next week. 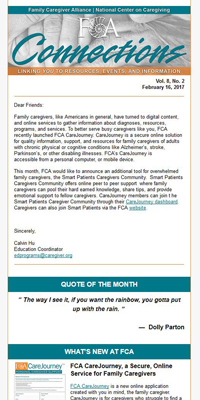 ﻿FCA's Connections e-newsletter focuses on issues and information important to family caregivers. The newsletter regularly covers tips, articles, and helpful advice that can assist families with the numerous daily care tasks that caregiving for loved ones presents — including the often overlooked “caring for yourself.” While much of the content can prove helpful to caregivers nationwide, the events included are local to the six-county region of FCA’s Bay Area Caregiver Resource Center.